SCENARIO: we’ve all just watched an intense battle of two teams playing for the third time this season. The eventual champion is not just winning their first title, but playing in the Final Four for the first time ever… that team is Tennessee! They beat Kentucky 72-64 to win it all. It was an excellent Final Four, featuring three #1 seeds (Tennessee, but also Duke and Michigan State) and #3 seed Kentucky. The story of the NCAA tournament, though, much like George Mason in 2006, is a team from much humbler beginnings, though they fell just short of Final Four glory. More on the Vermont Catamounts later. 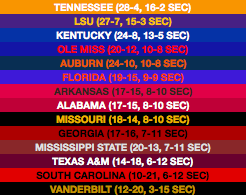 SEC: Tennessee’s excellent season continued the whole way through. Though they fell from the #1 spot after losing to Florida on February 9, they only lost once more after that, to Kentucky (also at home, so the Vols went a perfect 10-0 in true road games). LSU’s surprising start turned out to be real with a second-place finish. In the conference tournament, it was a previously disappointing Auburn’s turn to shine. An upset of Tennessee in the semifinal led them to a championship and elevated them to a 7-seed in the tournament. Despite a really disappointing conference season, Mississippi State’s non-conference résumé got them in too. 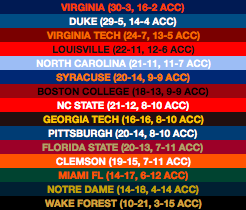 ACC: As is becoming the norm in these sims, Duke and Virginia steamrolled the rest of the country. UVA got their revenge to split the season series with the Blue Devils, and although Duke had a couple more unusual losses (including Syracuse, again), they won the ACC tournament to enter the NCAA tournament at #1 overall. Virginia was #2 overall – despite being ranked #6 in the AP poll. Big Ten: Michigan State won the conference easily, punctuating it with a 68-63 win over rival Michigan to finish 18-2. But Michigan got their revenge in the conference championship game, winning by the exact same score! Big XII: The streak continues, with Kansas winning the Big XII at 13-5, over a group of 3 teams at 11-7 and four more at either 10-8 or 9-9. Only WVU and Oklahoma State are totally out of it, and they’re the only teams in the conference that don’t make the NCAA tournament. Big East: Marquette was probably looking at a 2 seed in the NCAA tournament until they were blown out by Seton Hall twice in the span of a couple of weeks, first in New Jersey and then at MSG in the conference tournament. Instead, it’s a 3. 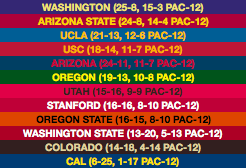 Pac-12: 3 bids looks like the ceiling for the Pac-12 now, and that’s what happens here. Washington and Arizona State pull ahead of the pack, and both are meriting of at-large bids, but the league locks up a third when they both lose in the conference tournament semifinals. The automatic bid goes to Arizona when they beat UCLA. 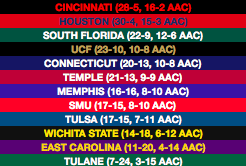 AAC: One of the teams many are surprised to see make the tournament is Temple. The Owls actually entered the conference tournament on a six-game losing streak, but two wins in the AAC tournament are deemed to be enough to make Temple one of the last four teams in the NCAAs. Only two at-large bids were earned by a team outside the 7 best conferences – Nevada, despite not winning either the Mountain West regular season or tournament, is worthy of an at-large bid (high up, too, as a #3 seed). And the very last team in the field is San Francisco. The heartbreaker of conference championship week is Hofstra – the Pride went undefeated through CAA play but took a shocking loss to James Madison in the tournament quarterfinal. 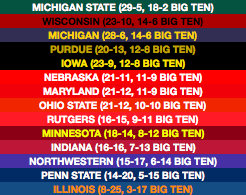 Breaths were held on Selection Sunday as opinion was split on whether the 27-4 Pride could get in, but it was not to be. NIT: This week I built in the ability to project & simulate the NIT to BracketBot, so it’s now part of Season Sim as well. Taking part at the NIT’s final four at Madison Square Garden this time were Alabama, Creighton, Fresno State and NC State, with the Crimson Tide defeating the Wolfpack to win the NIT title. This would be another addition to the lower-seed pantheon. Villanova in 1985. George Mason in 2006. Butler and VCU in 2011. Florida Gulf Coast in 2015. Their conference-mates UMBC in 2018. Now, 2019 Vermont! And in fairness, they’re not the only ones: (14)South Dakota State and (13)Northern Kentucky both win games, and Auburn’s late season run continues all the way to the Elite Eight after they upset both Kansas and Nevada. Alright, that’s all for this Season Sim! Hope you enjoyed it – this is just one way that the 2019 basketball season could end. Tune back in tomorrow for the weekly Power Rankings, and another Season Sim on Wednesday!